Photo credit | Cured New Zealand King Salmon with rosti, shaved fennel, quail egg and truffled aoili – love.fish. From energy-efficient kitchen appliances to biodegradable takeaway containers, love.fish has been designed with the environment in mind. The sustainable seafood restaurant in Sydney’s Rozelle focuses not only on serving ethically sourced, environmentally friendly fruits of the sea, but also on minimising the eco-footprint of the eatery itself. Take organic waste, for instance. “30 per cent of it ends up in a rubbish bin,” says love.fish maître d’ and co-owner Michelle Grand-Milkovic, explaining that she and husband Michael – the restaurant’s head chef – separate all food scraps and pay for a waste collection service for conversion off-site into an organic fertiliser. 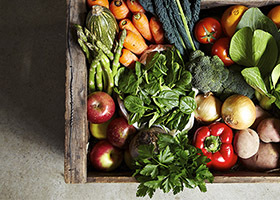 Ingredients used in dishes are similarly considered, featuring produce from Australia and New Zealand only, and a menu that proves sustainable seafood need not be limited – think mahi mahi, sardines, white bait, Loligo squid, cuttlefish, and more. While the definition of ‘sustainable seafood’ can be hazy, love.fish has created clear guidelines for their ingredients based on thorough research. “Some species may be deemed ‘sustainable’, but if they’re caught poorly there can be a lot of by-catch, so we use line-caught fish where possible,” says Grand-Milkovic, adding that farmed fish from land-based facilities are also considered as they are better able to contain waste. 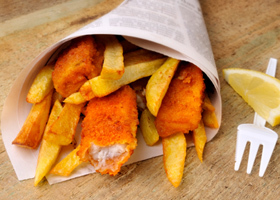 We may not all have a local fish ‘n’ chips joint as dedicated to greening their menu as love.fish, but Grand-Milkovic points to the choices we can make when dining out. If you find yourself at a restaurant and want to order fish or seafood, here’s a go-to guide for figuring out which menu option is best. Start by choosing Australian seafood only. Ask the restaurant – is this fish imported? If the answer is yes, say ‘no’. This will also mean your meal has lower food miles and a smaller eco-footprint than other seafood options, many of which are imported to meet consumer demand. Many popular types of fish are caught with trawlers pulled along behind fishing boats. These large nets are said to capture endangered sea species as by-catch, like turtles and sharks, which can be killed in the process. Fish that has been line-caught is a more environmentally friendly option, as this technique produces little by-catch and avoids over-fishing. Large fish like tuna, salmon and swordfish are at the top of our oceans’ food chain, meaning there are fewer of them and their stocks need to be kept in check. If you like a meatier, thicker fillet, choose fast-growing species of fish, such as mahi mahi, barramundi or Spanish mackerel. These smaller fish tend be more plentiful. 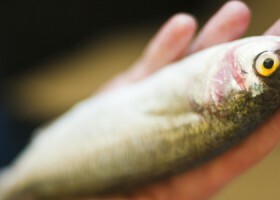 Plenty of restaurants mark menus with where their fish is from and how it was caught. For those that don’t, staff can help clarify your queries. Plus, asking to know more about your meal demonstrates to staff that patrons really are interested in these issues, thus encouraging the industry to improve their own awareness of ingredients and food sourcing practices.